I have just rebuilt and engine and I am currently having a loss of power. It sounded okay when it first started up, but the longer it's been on the more it seems to be degrading. When I accelerate it's very laggy and doesn't have much power, but it does eventually rev up to around 5K. I am also having some intermittent backfires that keep increasing the longer the vehicle is on and it's getting harder to start. I am re-using a (well inspected and perfectly okay) MOPAR camshaft with the same EngineTech lifters it used previously. It overheated and had a bent push rod because of a stuck valve last year. I inspected the lifters and watched many videos on the process and sent the pictures to the machinist. He didn't see anything wrong with them and I couldn't find anything. The machinist that worked on the head for me is very reputable and has been machining and building engines for about 40 years at his shop. I went back a retested and C3 was down to 125 and C4 I tested more than the rest. It always stayed at 90. I had all spark plugs removed from all cylinders with this test. My thinking is that I am going to retest, but this time try a spark plug on either side of the testing cylinder, then both cylinders to make sure there isn't a leak there. I suspect a cylinder to cylinder leak which is why I want to do this. I also noted a little bit of tiny oily-esque bubbles in the water (my coolant system is filled with nothing but distilled water ATM). When the vehicle is running there are no bubbles coming through the radiator cap and I don't have any air that I can burp out of the system so it doesn't seem like there's a leak there. Some oil did get inside the water jackets while I was oiling up the cylinder portions before I put the head bolts in so I suspect that is what that is. The oil doesn't look milky either. I used 2 Victor Reinz MLS headgaskets I wanted to cut costs and was willing to deal with taking the head off if it didn't work. I investigated and although everyone naysayed it I could only find two people that actually did it and they didn't have any problems with it. Both guys were running turbos on cast iron blocks, one of them using over 20PSI and he had used that setup successfully for the past 3 years. I don't have the dowel pins to line up and keep the head gasket in place so I used a layer of copper coat to keep them stuck together and to the head while I assembled. The reason I used two HG's is because I had this engine custom built with a lot of compression and forged pistons that used 29CC's of dish. After Dean finished working on the head he said it would have more compression because he made the seats sit like they were supposed to. Previously the seats were in varying heights from one cylinder to the next and he didn't approve. I am thinking that if I pull the head I will certainly inspect the lifters and cam, but if they still look fine I'm going to leave them. It seems like when you buy parts made in the US they actually last and can take a licking. I want to know if anyone has any other recommendations on things I may be overlooking. In regards to the super charger I see the diaphragm closing so I know boost is taking place. I just need to pull the injector to make sure the Split Second unit is reading it and opening the injector. I checked the tune to make sure it was still there from when it last ran. Also, the exhaust setup was removed and is currently wide open, I could see the fuel injectors running at 35% fuel trim so I disconnected them for the time being until I get to the exhaust shop to finish piping it up for me. I've ran without O2's before in the past and it just runs at 10 AFR without any issues, other than decreased MPG. 3. After Test 2 if I don't see any differences I'm going to purchase a leakdown tester. What was your deck height and cyl head chamber cc's? That #4 cyl doesn't look promising. Who's pistons are they? What valves did you use? Last edited by RCP Phx; January 8th, 2018 at 11:36. The block was decked to 0. 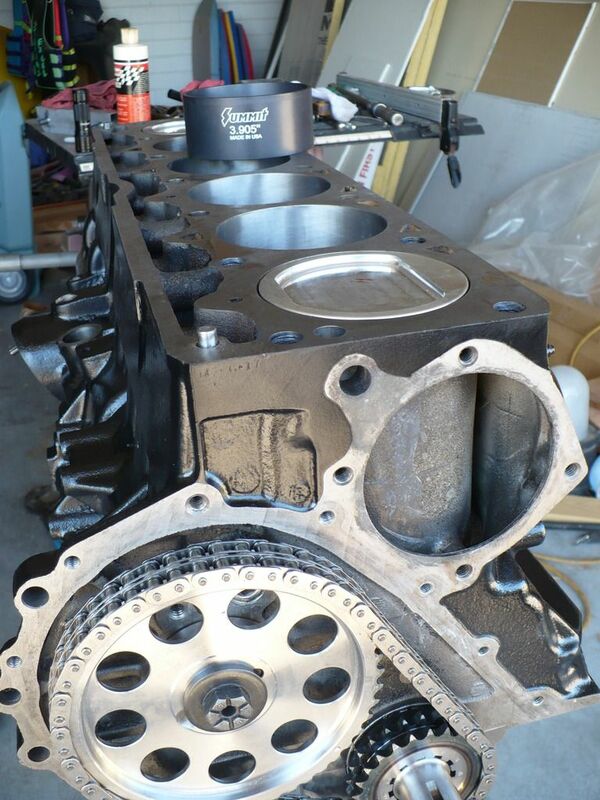 The deck height with those gaskets should be around .082"~, which is pretty close to the OEM total height given the blocked deck and the OEM gasket is .051". The pistons are Wiseco and the valves are Manley, stainless steel. 1.5" exhaust and 1.94" intake. Cylinder head chambers are 60cc. I've decided I'm just going to use one head gasket. The numbers are still safe for one, I just need to always use 90 octane or more. I ordered the last VR off RockAuto and a set of push rods slightly longer to compensate for the difference. I got 9.677" Sealed Powers off of Summit Racing on the way. Here's my engine math in case anyone is curious. It's as compressed as I think it can be to safely run 6-8lbs pounds of boost. I had to get a 49mm pulley from Sprintex to be able to make boost on a stroker along with a 68mm F&B throttle body. I would not try and do "math" with pushrod lengths. The only proper way is to measure! What rockers are you using? I would also recommend getting some ARP head bolts to hold this thing together. As far as I know, the factory rockers have to by torqued down. It's just a bolt so if it's not tight it will come loose. It's not like a small block Chevy that uses the method you describe. The pushrods need to compress the lifter some, that's their purpose. Should they compress the lifter a quarter of an inch? Scratch that, they're not compressing the lifters, they're opening the valves. I sense I need shorter push rods, shorter than the ones I just ordered. Regarding camshafts, I have the dowel pin setup. The other is a keyway in the nose like a crank. I could get a timing set for $24 from RockAuto and the keyway setup (That's the actual 2000 and later design which my vehicle is, but I bought a dowel setup years back). Does anyone know of any differences that should be considered? I am going with the OEM supplier, EngineTech. Or does anyone know of any other reputable cam provisioners that have their cams made in the US and not bought overseas and just reground? I'm trying to avoid cost cutting cheap metallurgy used in the materials which I am certain EngineTech and Mopar avoid. You have to get the proper lifter pre-load so that's where measuring starts. When I did the stroker build on my 2000 I switched over to the early cam for better/more cam options plus the ability to run a better timing chain. I decided on Comp Cams more stock'ish grind with a little more intake valve opening time. I spent the extra $150 to have it nitrided for 36 hours as well. I also went with their higher energy lifters which certainly sound like an improvement. It's going to be as resilient as is humanly possibly for a stroker to be.